This statement by the charismatic chairman and CEO of the iconic brand Starbucks Howard Shultz means a lot. 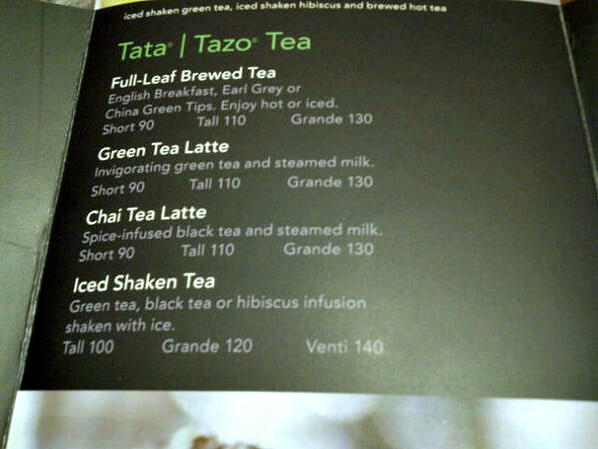 On Fri last a grand partnership between Starbucks & the highly respected Tata group was launched in Mumbai India. The event lay to rest much of the speculation whether Starbucks will actually enter India a nation long associated with tea drinking. Deep Mitra my friend who was there says that the large crowd was excited to take part in the historic inauguration. I am sharing a couple of pictures sent thoughtfully by Deep with you dear readers. The big question is can Starbucks attract the Indian consumer enough to shift their loyalty from the Café Coffee Day (CCD) 1200 outlets and the Barista Lavaza 200 outlets which are well entrenched and strategically located. Will the price conscious consumer fall to the charms of the world’s most popular brand? Will Starbucks in due course become the market leader? Choosing the right partner is the key to sustainable success in a strategic alliance and this partnership is just that. The tangibles are in place by leveraging Tata’s prime real estates, the coffee plantations and the synergies coming from the historic Taj Mahal hotel services. This first Starbucks big store is impressively housed in Tata’s historic Elphinstone Building and the next one will be in the Taj. The intangible too are huge as both leaders Howard Shultz and Ratan Tata share an approach that is important not only for profitability but a common chemistry and common value system with a deep sense of humanity. Though Starbucks leverages its global brand strength with standardized stores and menu it has made a bold change here in India by blending its global culture with the Indian culture. After all Starbucks is a 40 year old culture and the change will surely throw-up some serious challenges. Starbucks has done right to tune-in to the local culture by Indianizing some of its flavors in food offerings to give it a local twist – Mawa croissants — made with cardamom and milk solids — and delicious and nutritious tandoori paneer rolls. Starbucks price positioning is at the high-end of India’s coffee cafes like Barista and CCD, with a 12 ounce cappuccino retailing for a little over $2. Finally in an interview Howard Schultz states the “Tata tie up will help us to emerge as leader”. And Tata Global Beverages shares surged 7% to Rs 141 back of heavy volumes. Lets wish a grand success to Starbucks, Tata’s and to the consumer a great coffee experience. 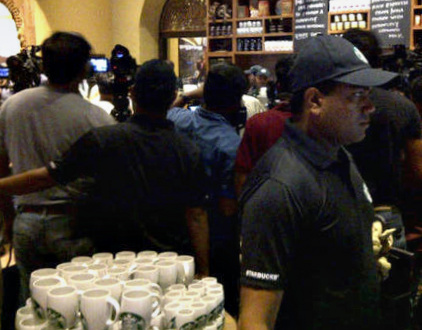 Posted by dilipnaidu on October 21, 2012 in Strategy - Global Business and tagged charismatic, global, Howard Schultz, iconic brand, Ratan Tata, Starbucks opens first store, Starbucks Tata. I am not a fan of either….give me my filter ‘kapi’ anyday! But the son in law is part of the think tank at Cafe Coffee Day and thinks Starbucks will not hurt them. Didn’t expect anything else from the competition 😀 Will be interesting to see how it pans out. 🙂 ya I too am a filter coffee type … CCD ain’t afraid of Starbucks – is an authoritative input and I tend to agree .. perhaps they may play their games in different customer segments .. Need to try this, when it comes to Chennai eventually 🙂 I am very choosy about Tea/Coffee and I like only certain flavors. I tried many coffees in CCD and I seem to like only two of them. And I am not sure how they can make the tea better than Indian tea version! It will be very difficult to compete with Indian hotels on the taste and of course, the price! India is not much into coffee….atleast not in a big way still. I have lived in Delhi and CCD is the hangout place for most ppl including students. Starbucks will have to have nominal rates and something new to attract crowds otherwise it will only be the corporate bigwigs and the upper class visiting the place. Cheers & thanks for stopping by. Better to decide our priorities now & [mmediately. Do we want the ELITE to prosper and enjoy life or do we want average Indian to prosper and be respected in all countries?? We have taken too long. Standard of a school is decided on the performance of its average student and not the topper. Suhas I got your point but aren’t we living in a ‘Free World’ inclusive of the elite and the average citizen? Ours being a growing economy operating in a globalized world we have enough space for both segments to thrive. In your last blog on Starbucks.. we all discussed about the Tea (Chai) in their menu. But seriously, I never think that they will include the same… its very amazing..
Hope they will maintain the American Culture for Quality Control. Starbucks is selling a lifestyle and those already experienced their products firmly believe Starbucks is here to stay in India.needless to say CCD,Barista and Starbucks have their own USP and all are targeting different level of customers. Finally I didn’t feel Starbucks’s products are very expensive and for a change I won’t mind to visit Starbucks outlet. I dont think I have had a starbucks yet. People may run to it as foreign stuff attracts many.But beware it should not turn out tobe another PL 480.This is my fair assesment as usual. Ha ha Suhas so you bat for the “swadeshi mantra’ eh? History won’t repeat as Starbuck’s intent is to preserve and enhance its global image. Swadeshi Mantra.. helps in increasing the GDP of our country but company like Starbucks gives us lifestyle and globalization. BTW you are right a globalized world the Swadeshi products go hand-in hand with global products. Sir.. you will shock to know that Armenia country don’t have Starbucks. I don’t drink at Starbucks so lets hope in India they don’t all run to Starbucks and still support those that have been there before!! Welcome to my blog. Yes you do have a point and too much coffee is not too great for health 🙂 But there were huge crowds waiting for their coffee on the opening day. I would have thought Starbucks was in India a long time ago. In Canada we have our own chain, Tim Hortons which is very successful. It’s a lower priced coffee/dougnut shop. Starbucks is successful here, too, but I would say not nearly as much as it is the US. Starbucks in India? Now that’s a tall order! Sir, I think Starbucks will create its own market in India, away from the likes of CCD and to some extent Barista and other standalone cafes. There is no way starbucks can compete with CCD in terms of outlets and pricing that is not the aim also. The selection of the location is also very symbolic. Upmarket business district of financial capital of India. Hi Hitesh you are spot on! My pleasure to read your response. Yes Starbucks has all the trappings to carve its own market and provide a great experience to the customers. All this is possible I feel beacause of the value system both the partners operate. Congratulations! I’m a great Starbucks coffee lover – at home mostly. But about once every month or two, after his doctor appointments, my husband and I love to visit Starbucks (inside Target’s Department store) and have an iced coffee and a carmel Frappuccino for me, along with, usually, crumbcake for DH and vanille scones or banana nut bread for me. The Mawa croissants and tandoori paneer rolls sound delicious! Maybe they will start serving them here, too! Starbucks may be popular because of its content..CCD is deteriorating, many of its outlets are dirty, not well kept and dont even serve what they advertise..
whereas Starbucks may keep the quality intact.I love their Marble loaf cake, meditarranean sandwiches and coffee with icecream. and their ambiance. True Starbucks is a brand that lives upto its Mission – “to inspire and nurture the human spirit – one person, one cup and one neighborhood at a time”.